The Siege is a 1998 American action thriller film directed by Edward Zwick. The film is about a fictional situation in which terrorist cells have made several attacks in New York City. The film stars Denzel Washington, Annette Bening, Tony Shalhoub, and Bruce Willis. FBI Special Agent Anthony Hubbard (Denzel Washington) and his Lebanese American partner, Frank Haddad (Tony Shalhoub), intervene at the hijacking of a bus fully loaded with passengers, which contains an explosive device. The bomb turns out to be a paint bomb and the terrorists escape. The FBI receives demands to release Sheikh Ahmed bin Talal, a suspect in an earlier bombing at the American embassy in the Middle East. Hubbard eventually comes into conflict with Central Intelligence Agency agent Elise Kraft (Annette Bening), as he takes a terrorist suspect into custody and arrests Kraft. Later, another terrorist threat is made and a Metropolitan Transportation Authority bus is bombed. The feds captures a man named Samir Nazhde (Sami Bouajila), who admits to signing the visa application of one of the suicide bombers in the course of signing many applications for student visas in his job as a lecturer. However, Kraft insists that Samir is not a terrorist and that his continued freedom is vital to the investigation. The terrorist incidents escalate with the bombing of a bus and a crowded theater and hostage-taking at an elementary school, and culminate in the destruction of One Federal Plaza, the location of the FBI's New York City field office, with over 600 casualties. In spite of objections, the President of the United States declares martial law and the United States Army's 101st Airborne Division, under the command of Major General William Devereaux (Bruce Willis), occupies and seals off Brooklyn in an effort to find the remaining terrorist cells. Subsequently, all young men of Arab descent, including Haddad's son Frank Jr., are rounded up and detained in Downing Stadium. Haddad resigns in outrage. New Yorkers stage violent demonstrations against the Army and the profiling of the Arabs; the Army fights to maintain control. There are reports of Army killings. Hubbard and Kraft, now revealed to be an agent named Sharon Bridger, continue their investigation and capture a suspect, Tariq Husseini. Devereaux's men torture and kill Husseini in the course of the interrogation. Afterward, Bridger tells Hubbard that Husseini revealed nothing of value because of the principle of compartmentalized information. Sickened, Bridger finally admits that she provided training and support to militants opposed to Saddam Hussein's regime, working with Samir to recruit and train the followers of the Sheikh. After the U.S. cut their funding and left them exposed, she took pity on the few of them who had not yet been slaughtered by Hussein's forces, and arranged for them to escape to the United States, ultimately leading to the present situation as they turn their bomb making and covert skills on the country that now holds their leader. Sharon and Hubbard compel Samir to arrange a meeting with the final terrorist cell. Hubbard also convinces Haddad to return to the FBI. A multi-ethnic peace march demonstrates against the occupation of Brooklyn. As the march is getting under way Hubbard and Haddad arrive at the meeting place, but Bridger and Samir have already left. Samir reveals to Bridger that he constitutes the final cell while in another sense he says, "there will never be a last cell." He straps a bomb to his body which he intends to detonate among the marchers. Hubbard and Haddad arrive in time to prevent him leaving but Samir shoots Bridger in the abdomen as she struggles to stop him. Hubbard and Haddad kill Samir but despite their best efforts the pair can only watch as Bridger succumbs to her wound after managing to recite certain lines of the second half of the Lord's Prayer and concluding with "Inshallah" – the Arabic phrase "God Willing". Hubbard, Haddad, and their team raid Devereaux's headquarters to make an arrest for the torture and murder of Husseini. Deveraux insists that under the War Powers Resolution the authority vested in himself by the President supersedes that of the court which issued the arrest warrant. Deveraux then commands his soldiers to aim their assault rifles at the agents, resulting in a Mexican standoff. Hubbard reminds Devereaux that the civil liberties and human rights which he took from Husseini are what all of his predecessors have fought and perished for. Devereaux finally submits and then gets arrested. Martial law ends and the detainees, including Haddad's son, are given their freedom. The film received mixed reviews from critics. Rotten Tomatoes awards the film a score of 44% based on 61 reviews. Audiences polled by CinemaScore gave the film an average grade of "B-" on an A+ to F scale. Roger Ebert gave the film 2​1⁄2 stars out of four, writing that director Edward Zwick does a good job with crowd scenes, but criticizing it as clumsy. Bruce Willis won the Golden Raspberry Award for Worst Actor for his performances in this film, Armageddon, and Mercury Rising. The film grossed $40,981,289 in North America and $75,691,623 in other territories on a budget of $70 million. When the film opened, the American-Arab Anti-Discrimination Committee came out against the film. Its spokesman Hussein Ibish said "The Siege is extremely offensive. It's beyond offensive. We're used to offensive, that's become a daily thing. This is actually dangerous." He thought it was "Insidious and incendiary" because it "reinforces stereotypes that lead to hate crimes." Ibish acknowledged that Arab terrorists did, in fact, bomb the World Trade Center in 1993, but said that Arab and Islamic groups are upset by "the very strong equation between Muslim religious practices and terrorism. ...[Thanks to this film] Every time someone goes through the Muslim ablution, the ritual washing of hands everybody does before they pray five times a day, that image is the announcement to the viewer of the presence of violence." Echoing such criticism the Council on American–Islamic Relations protested the insinuation that "Muslims have total disregard for human life." The groups were "faxing and calling news organizations on a regular basis" to voice their concerns. Anytime you talk about issues that touch on religion of any kind, you can anticipate this kind of reaction. Should we only present every group as paragons and monoliths of virtue? The movie inspires to engender this kind of dialogue. I happen to come from the school that thinks that movies should not only make you uncomfortable, they might make you think. …You can anticipate any kind of reaction in these times in which sensitivity seems very high in the culture. I have a friend who says, if you've not offended somebody, you're a nobody. …How does it feel to be a lightning rod? It gets the blood going. I think it's better than being universally ignored. In a culture where there seems to be so much to talk about, it's good to be talked about. "What the movie is most deeply about – it's about our own latent possibilities of repression, stereotyping and prejudice," said Zwick. "To see Americans rounded up in the streets, to see Americans put into stadiums, to see people held without habeas corpus – to have their rights violated in such a way is such a chilling and just terrifying thing to see – that is what one takes away, I believe, from this film." In a September 2007 interview, screenwriter Lawrence Wright attributed the film's failure at the box office to Muslim and Arab protests at theaters playing the film, but also claimed that it was the most rented movie in America after the September 11 attacks. Scholar Alexandra Campbell quoted from former Guantanamo Bay detention camp captive Tarek Dergoul when she compared the fictional demonization and extrajudicial abuse of Muslims in the film and the abuse that Dergoul described in his first post-repatriation interview. [T]he only way I know the United States is through movies from Hollywood or through cartoons. I’m a big fan of a lot of their singers…. [T]he first time I saw an American soldier was at Kandahar Air Base…. When I first saw myself in Kandahar, it was like I was in a cinema or a movie. 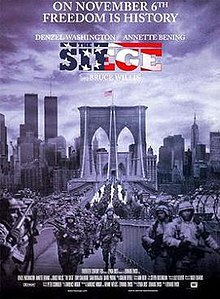 I saw a 1996 movie called The Siege. The movie was about terrorists carrying out terrorist attacks in the United States…. [In the movie] the CIA and FBI were not successful in finding that terrorist group and the United States Army interfered and gathered all the people of Arabic descent and put them in a land cage or camp just like it happened in Kandahar. I was shocked, thinking, "Am I in that movie or on a stage in Hollywood? "… Sometimes I laugh at myself and say, "When does that movie end?" ^ "Caught in the Middle". The Los Angeles Times. Retrieved 2010-10-24. ^ "The Siege (1998)". Rotten Tomatoes. Flixster. Retrieved 2010-12-01. ^ Ebert, Roger (November 6, 1998). "The Siege Movie Review". Chicago Sun-Times. Sun-Times Media Group. ^ Wilson, John (2007). "Nineteenth Annual Razzies (1998)". The Official Razzie Movie Guide. Grand Central Publishing. ISBN 9780446510080. ^ "The Siege (1998)". Box Office Mojo. Amazon.com. Retrieved January 4, 2010. ^ a b "Muslims feel under siege from Hollywood". November 5, 1998. ^ "Islamic Council Protests Timing of 'The Siege'". Los Angeles Times. August 25, 1998. Retrieved 2010-10-24. ^ "Director Ed Zwick defends 'The Siege'". CNN NewsStand. November 10, 1998. Archived from the original on January 4, 2010. Retrieved January 4, 2010. ^ Martin, David (September 9, 2007). "Reporting The Bin Laden Beat". CBS News. Archived from the original on January 4, 2010. Retrieved January 4, 2010. ^ Hayward, Keith; Presdee, Mike (2010). Framing Crime: Cultural Criminology and the Image. Taylor & Francis. pp. 107–8. ISBN 978-0-203-88075-3. ^ Dave Gilson (2006-07-12). "Why Am I in Cuba?". Mother Jones. Archived from the original on 2006-07-19. Retrieved 2016-02-17. Detainees could respond directly to the accusations made against them and were assigned to an officer who shepherded them through the process. However, they did not have access to lawyers and often could not fully examine the government’s claims, particularly if those claims were based on classified information.